Jeff For Banks: Strategy drives structure... in theory only? Strategy drives structure, so says Peter Drucker. Do you believe him? Does your strategy drive your structure? I taught Organizational Structure this week at the North Carolina School of Banking. I was the one in the room with the accent, by the way. But I digress. I created a case study of a bank called Blue Collar Bank, a New Jersey thrift whose vision was to be the #1 financial institution for working families in its markets. The assignment was to develop an organizational structure conducive to executing its strategy. For the sake of time, I could not call each student to present their results, so I asked for volunteers. One student bravely came to the front of the class and presented an organizational structure that looked like the below chart. I have never seen such a structure. When the student first described it, I imagined that this could be an Apple or HP structure... a company that was strong in product management. Imagine having Marketing and IT reporting to the executive in charge of Product Management and Distribution? 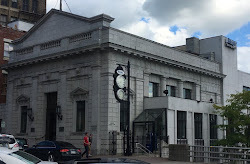 Upon reflection, this structure has merit. I have heard from multiple heads of IT that they lack clear direction in managing projects... which ones to undertake, and in what order. IT steering committee projects are driven by anecdotes and compliance. What if the project list is driven by the bank's strategy and managed by an executive responsible for delivering the right products over the right channels to target customers as described in its strategic plan? That would be revolutionary to our industry! IT and other traditionally operational areas in FIs often report to other operational executives that are focused on making sure the back office runs efficiently. Now that most of our customer interactions are occurring through electronic channels, doesn't it make sense to re-think this structure? Hats off to this creative student. Is it no surprise that he works for a marketing company that supports FIs, and is not a banker? What are your thoughts on FI organizational structures? 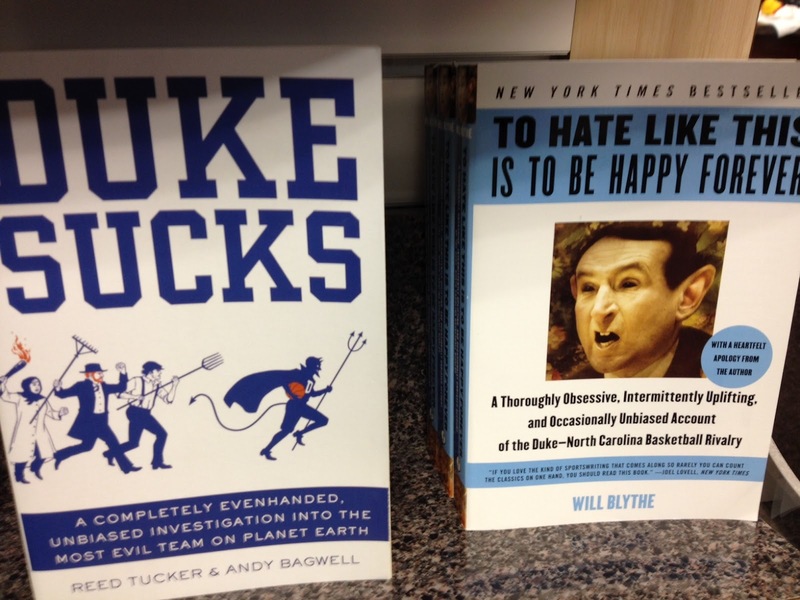 Note: Below is a picture of the books at the UNC Chapel Hill bookstore. 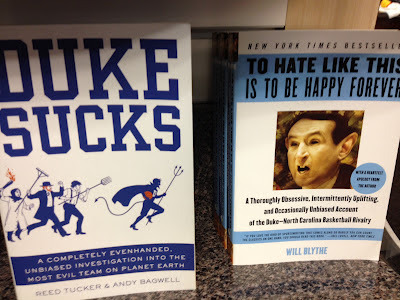 In case you were wondering about the seriousness of that rivalry.